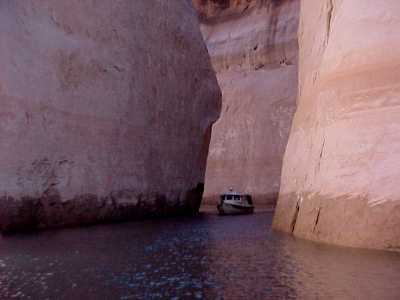 -----We are living in the real Jurassic Park, here on Lake Powell. The towering cliffs above our anchorage are the lithic detritus of the Mesozoic. The grains of sand, now frozen into the rock of the cliff, once blew into the eyes of Tyrannosaurus. Velociraptors chased their prey sprinting over the mud particles that we scrape off our anchor. Before the grains were imprisoned by cementation into rock, they vibrated with the terrible roars of the Thunder Lizard. Pick up a handful of sand from a beach on Lake Powell - look at the grains - and think of what events and creatures they witnessed. -----A few centuries ago, stoneworkers in a quarry in Bavaria made a remarkable find. They lifted a slab of rock from the quarry wall, and frozen within the flat plane of one face of the rock was a skeleton. The long neck of the creature was twisted backward by the agony of death. The workers were astonished when they saw, affixed to the end of that neck, an elongated skull that ended in a beak! The outstretched arm bones were surrounded by a halo of fossilized feather impressions - they were wings. A long feathered tail could be faintly seen in the gray rock- it had been a bird! Fortunately, they recognized the importance of their discovery, and soon paleontologists were announcing to their kin that Archaeopteryx, the earliest known bird, had been found. -----Since that discovery, geologists have found that birds and dinosaurs were close relatives - close enough, that many reptiles had feathers and many birds had scales. Perhaps you should show more respect for that sparrow outside your window - his genealogy is more impressive than yours! -----That contorted skeleton is the same age as the cliffs that tower over Lake Powell. 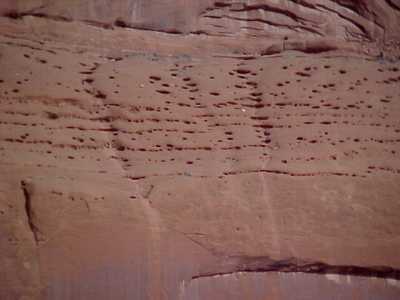 Bird fossils, however, have yet to be discovered in Lake Powell rocks, although there is good evidence that they lived during the times when these rocks were sediments. Birds often eat pebbles to store in their crops. When they eat hard seeds or bones, they churn these stones and grind their food before swallowing. Some dinosaurs apparently did the same thing, since neat piles of smooth, rounded stones are sometimes found with dinosaur skeletons in the right location to have been in their crops. You know how beautiful pebbles are that have been through a lapidary tumbler? That's how dinosaur gizzard stones look. Large gizzard stones, probably from dinosaurs, are found in Lake Powell rocks. Piles of small stones have also been discovered here - could they have been from some of those early birds? -----The best evidence of the presence of "dawn" birds is all around you when you are cruising the lake. You know how woodpeckers love to wake you up in the early morning pounding on trees (or your roof) looking for insects under the bark. Well, the ancient birds of the genus Eornis (Eo = Early; Ornis =Bird) also did a lot of pecking, since they were adapted with large bills just for that purpose. They had large eyes, the better to keep a watch for flying predatory reptiles, like Pterodactyl. Those huge eyes, though, were a bit of a disadvantage during the frequent sandstorms of the desert times. They, however, developed the interesting adaptation since forgotten by most birds today - they could fly backwards to keep the sand out of their eyes. There must have been a few interesting "mid-airs." -----Anyway, back to those big bills on Eornis. They were so effective at removing insects from trees, that one insect, of the species, Microbugus grindstonensis, developed a technique to evade Eornis. That group of insects adapted horny raspers on their mouthparts that enabled them to burrow tiny holes deep into rocks and evade Eornis and their kin. But, isn't nature incredible? One remarkable species of genus Eornis quickly adapted a reinforced beak sheathed in silica to drill out those little buggers - and the evidence of their drilling is everywhere around you.